Wine and Cheese? Yes, Please! One of my very favorite things to do is to host cocktail parties for my friends. I love getting everyone together relaxing and catching up. As much fun as the actual party is, it isn’t exactly stress-free deciding what to serve and getting everything ready. Gone are the days when I can throw some Doritos in a bowl and some Bud Light in a cooler and call it a day. Now, there is a little bit of pressure to serve something that people actually want to eat and drink, and also something a little outside the norm. Say hello to wine and cheese. A match made in culinary Heaven. 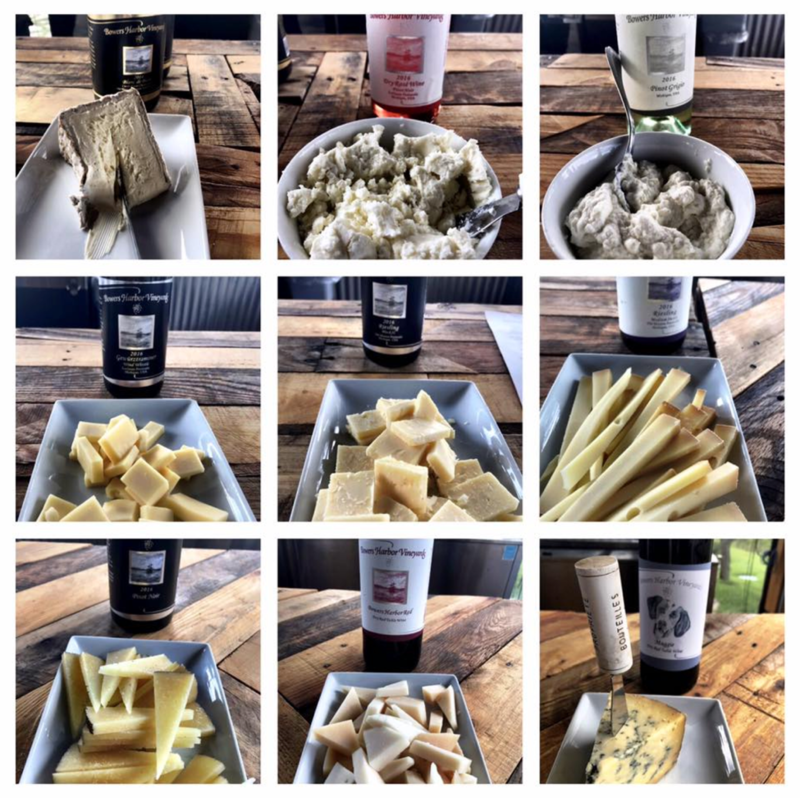 Last week, the Bowers Harbor Vineyards staff was treated to a wine/cheese pairing put together by our Chef Morgan. It was beyond delicious and we all learned so much about what wines go with which cheeses, and why. It was so cool to see what happens to the flavor profiles of both the cheese and the wine when tried separately, and then together. All of the cheeses from this evening were from The Cheese Lady, if you haven’t been to her shop in Downtown Traverse City, definitely make a point to visit. Delicious! They also have locations in Muskegon, Grand Rapids, Kalamazoo, Farmington and Rochester. I’ll take you through the pairings just as we tried them. Print this off, save it, serve a few of these at your next happy-hour get together, and you are sure to wow your guests. 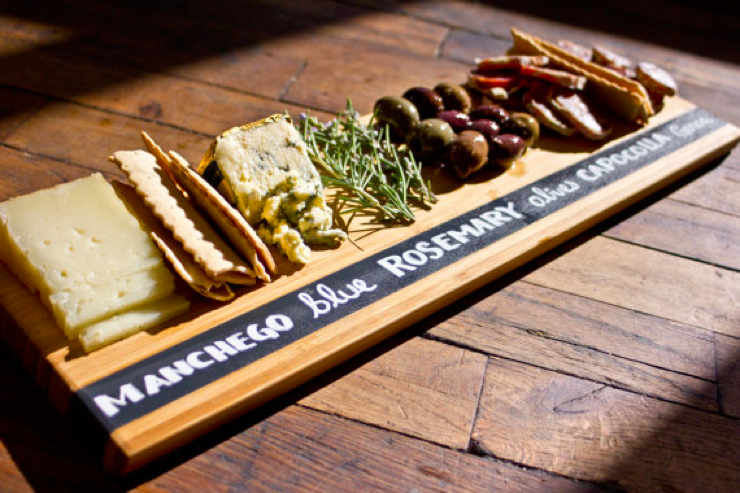 I serve mine on a chalk-board serving dish that I can write on to let guests know which cheeses are which. Similar to this one on Etsy. Side note: these trays are also a perfect housewarming gift! 1. Delice de Bourgogne- a French classic triple crème brie-style cheese originating from the Burgundy region of France. The cheese is made through the process of blending a high fat cow’s milk cheese with crème fraiche that gives it a very creamy light texture almost like a whipped butter. Unlike many brie’s of this style it has a very heavy bloomed rind that gives it an earthy note on the palate. The Blanc de Blanc Cuvee Evan, makes a great pairing. The fine bubbles help to cut through the heavy fat content of the cheese. 2. Capra- This Belgium chevre is a unique style goat cheese, which the goats are grazed on herbs and grasses on the hills of the Ardennes and it's made with the local honey which gives this cheese a hint of sweetness. Pinot Noir Rose, a light, dry Rose will help to cut back on the sweetness while also helping to bring out the fruit flavor of the wine. 3. Fresh Ricotta- Made from whole milk, this is a creamy rich cheese with a little sweetness and tanginess. Our Pinot Grigio has a very crisp and clean taste that will help to cut through the heavy rich cheese and bring out the refreshing citrus in the wine. 4. Fontina Fontal- found commonly in Northern Italy, is a younger, creamier style of Fontina. A lighter style of cheese with just a touch of sweetness and a very mild flavor. Our Wind Whistle Gewurztraminer is very fitting in its light refreshing flavor with just a hint of sweetness to match the intensity of the Fontina Fontal. 5. Prairie Breeze- An interesting twist on a hard-white cheddar, it's crumbly with a creamy-crunchy finish. It is made on Mennonite farms in Iowa. Riesling Block II – A refreshing, almost Sauvignon Blanc style of Riesling, works wonderfully to cut the sharpness of the cheese while giving it a more of the creamy mouthfeel. 6. Appenzeller- Found in the Appenzell region of northeast Switzerland, has a very strong herbal rind that is typically coated in wines or ciders to help its growth. This nutty, tangy cheese has a history documented over 700 years ago. A very pungent smelling cheese. The sweetness of the Medium Sweet Riesling, will help to cut through some of the strength of this cheese, and bring out the nuttiness. 7. 12 month aged Manchego- Originating from La Mancha Spain, a very nutty semi-hard cheese made from sheep’s milk. The strong berry fruit flavors and the hint of smoke from our 2016 Pinot Noir are a wonderful way to complement the nutty firm texture and flavor of this aged Manchego. 8. Beemster Goat Gouda- The unique blue sea clay soil grows special grasses, that when ingested by the goats helps to produce a soft, sweeter style of Dutch Gouda. Bowers Harbor Red is a lighter red, subtle raspberry and cherry fruit flavors complement the Beemster Goat Gouda. 9. Stilton- This pungent blue cheese is a staple in English cuisine. Stilton can only be made in 3 counties within the country (Derbyshire, Leicestershire, and Nottinghamshire) and can only be made from 6 different dairies. This is a semisoft blue cheese with a very sharp must aromatic and flavor profile. Maggie being a strong assertive red wine, will be a nice pairing for a stronger blue cheese. 10. Cambozola- This crème brie style blue cheese come from the German region of Allgau. The cheese is made by injecting a brie style cheese with the Penicillium roquefotri mold used in many strong blue cheeses. By doing this the cheese has a soft creamy texture, and not a pungent of an aroma, but the strong rich blue cheese flavor. The richness of this cheese goes great with dessert style wine and liquors, both the Appletage and the Ice Cider make nice pairings to help cut through the strong blue cheese flavor and go nicely with the creamy texture. Hope this list helps you decide which cheese and wine to serve at your next party. It sure helped me! All of the wine on this list can be purchased in our tasting room or at our online store. Click here to shop! Cheers! I am now three weeks into my new position as Marketing Manager for Bowers Harbor Vineyards (BHV) and wow, I have learned a lot! I came into this position having been familiar with BHV for years, as I’ve helped in the tasting room here and there during busy seasons and events, am an avid wine drinker myself and have a passion for the bustling wine scene here on Old Mission Peninsula. I have years of experience in the marketing world, which is also something I love and the opportunity to combine two of my biggest passions at my favorite winery is like a dream come true. I’m so excited to be here and learn all about the wine making process and everything behind the scenes. So hi! I’m Alaina Dodds and I look forward to meeting all of you when you visit us! Visiting a winery and doing wine tastings with your family and friends is so much fun, right?! I’ve witnessed couples, singles, regulars, first-timers, bachelorette parties, anniversaries, groups of friends and families enjoying their time at BHV in just the past few weeks. I love watching the enjoyment on everyone’s faces. It is our job to make working in the wine industry look and feel fun and carefree. We want you to come into our tasting room and truly relax, learn something, have some laughs and go home a little happier than you were before (and tell your friends about us). What I have never really thought about…until now, is how much work actually goes into ONE bottle of wine! Or how much happens behind the scenes to ensure that the guests have a variety of high quality wine to choose from and that the staff is educated on the entire selection. The labor of wine is intensive, finicky, tough, stressful and oh so rewarding. The grapes shown in this photo below are the Chardonnay grapes grown in the block of vines right in front of the tasting room. The first picking of these grapes will be in mid-to-late September and will make our 2017 vintage of Cuvee Evan Blanc de Blanc. This is really exciting because the fist vintage of this wine was in 2005, then 2009, then 2014 and this year’s will be our 2017 vintage which won’t be available until 2020, due to the three-year aging process. We follow the traditional champagne method (methode champenoise), which is universally acknowledged as producing the highest quality and most age-worthy sparkling wines. The Chardonnay grapes are currently measuring 8-10 degrees brix and we want them to be at 19 brix before we harvest. Because we have had some cooler weather this summer, harvest will be a bit later than usual. We pick these grapes earlier in the harvest season because they retain more acid and not too much sugar. Acid helps the fruit characteristics come forward and also helps to have longer aging potential. This block of chardonnay grapes was planted in 1991 and has 750 vines. It’s incredible to think about how 26 years of growth and 750 vines of grapes can produce just a few kinds of wines. 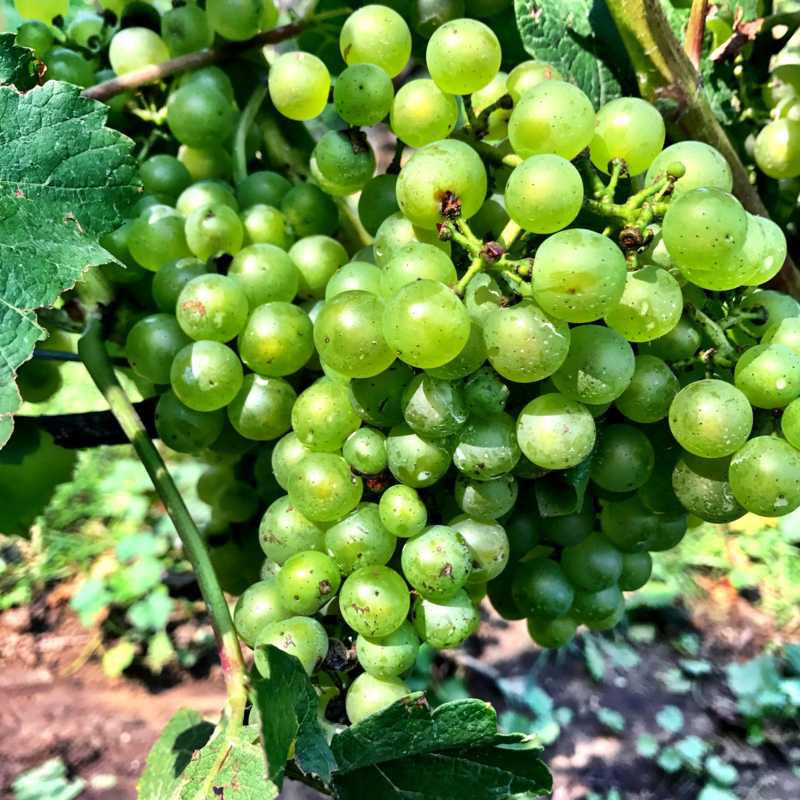 Our first picking of this block will be used to make our Cuvee Evan Blanc de Blanc and our second picking (once the residual sugar levels have increased) will make our Chardonnay RLS Reserve. I know you don’t want to wait all the way until 2020 to try our Cuvee Evan Blanc de Blanc, good thing you don’t have to! 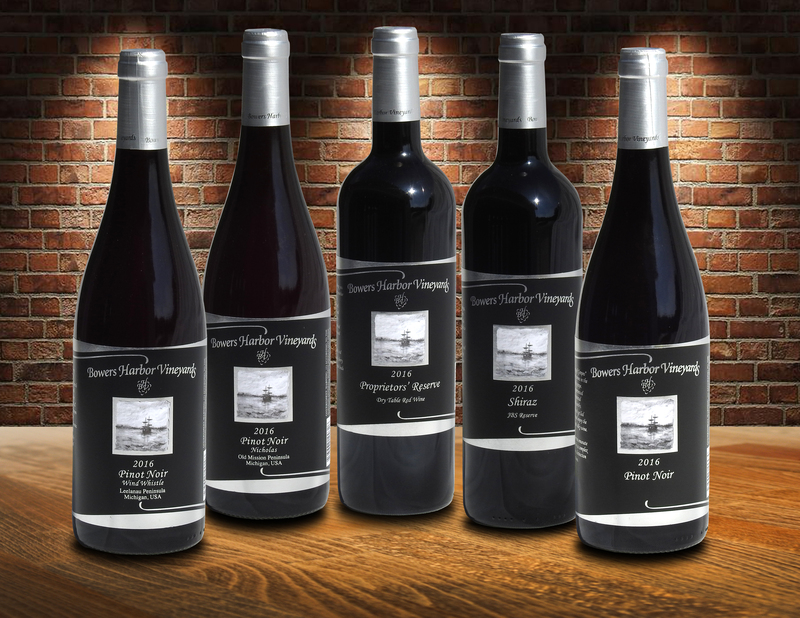 We just released our 2014 vintage, we only have 90 cases though! You can pick up your own bottle ($38) or case when visiting our tasting room or by purchasing online here. See you next time when we take another journey through the vines and behind the scenes at Bowers Harbor Vineyards!